The two characters I had the most trouble with when learning Morse code were P and X. So then, of course, it makes perfect sense that my original callsign was WNØPXT. I graduated rapidly to WAØPXT as a General, then Amateur Extra, class licensee. that adorned my 1st car, a 1967 Austin Healey Sprite. That license plate is on my shack wall to this day. 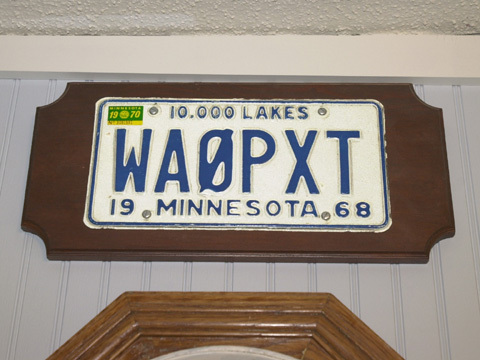 A move from Minnesota to Ohio in 1972 required a new call sign back then. The "luck" of the draw gave me WB8RGZ, my least favorite. Lengthy on CW, awkward on phone, they were even the pits on RTTY. Most of my operation in those days was on 2 meters so I never even printed any QSL cards. W8HQQ(sk) dubbed me "Ruggs", derived by "pronouncing" R-G-Z. an Amateur Extra class license to apply for a callsign of their choosing. It may surprise you to know that my first choice was W8RC. his application was higher in the pile of paperwork on some Gettysburg desk than mine was. I should be proud to be the first to hold K8RC. Len has had a long and distinguished career of leadership & service to the hobby. I'm proud to share a suffix with him. Even your Social Security or phone number might be used to identify someone else in another context. Your name is especially not unique, either. N3LQD, VK1AAK, W2EAL, W5RMC, WB5OLI, WB9SNS and WD6ECH all have something in common. They are all named Robert Craig. But by international agreement only K8RC is ME! *Unless your US call begins with an "N" in which case there might be an aircraft named after you. Whenever I hear a "counterpart" on the band, I try to work them.